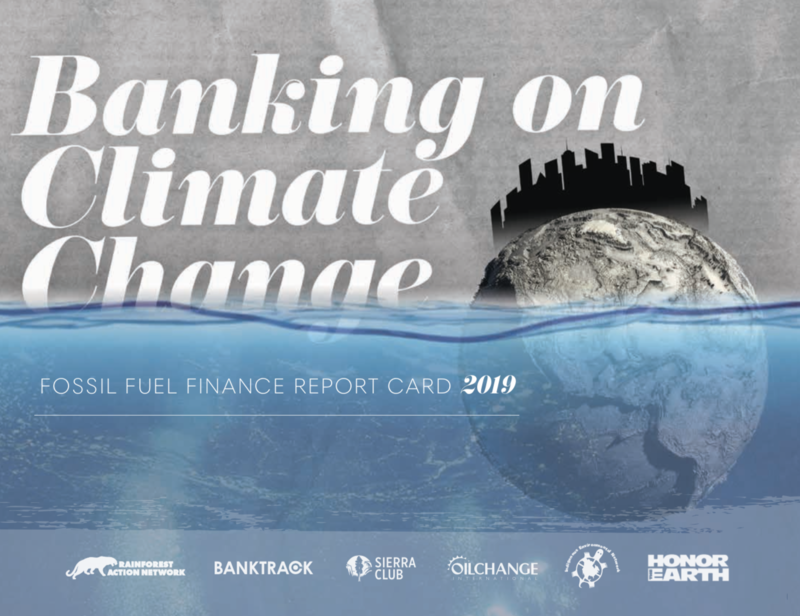 Banking on Climate Change 2019 reveals that the four biggest global bankers of fossil fuels are all U.S. banks – JPMorgan Chase, Wells Fargo, Citi, and Bank of America. Barclays of England, Mitsubishi UFJ Financial Group (MUFG) of Japan and RBC of Canada are also massive funders in this sector. Notably, JPMorgan Chase is by far the worst banker of fossil fuels and fossil fuel expansion – and therefore the world’s worst banker of climate change. Since the Paris Agreement, JPMorgan Chase has provided $196 billion in finance for fossil fuels, 10% of all fossil fuel finance from the 33 major global banks. JPMorgan’s volume of finance for fossil fuels from 2016 to 2018 is a shocking 29% higher than the second placed bank, Wells Fargo. The bank stands out even more from its peers in its volume of financing for the top companies expanding fossil fuel extraction and infrastructure: since the Paris climate agreement, JPMorgan Chase’s $67 billion in finance for the expanders is fully 68% higher than that of Citi, in distant second place. The report also grades banks’ future-facing policies regarding specific fossil fuel sectors and fossil fuels overall. In assessing restrictions on financing for fossil fuel expansion, no banks scored above a C-range grade, and most bank grades were in the D range. No banks have made commitments to phase-out fossil fuel financing in alignment with a 1.5°C-aligned Paris-compliant trajectory, despite the fact that numerous banks and bankers – including JPMorgan Chase CEO Jamie Dimon – have declared their support for the Paris Agreement. The report also analyzes the banks’ unacceptably poor performance on human rights, particularly Indigenous rights, as it relates to the impacts of specific fossil fuel projects, and climate change in general. The case studies detailed in the report – from the Indigenous-led opposition to each of the three major proposed tar sands oil pipelines in North America, to the fragile Arctic National Wildlife Refuge under threat from drilling, to German utility RWE’s plans to expand an open-pit lignite coal mine while destroying the 12,000-year-old Hambach Forest – all highlight that banks lack effective energy and human rights policies to prevent them from financing these highly problematic projects and the companies behind them.